Three of the country’s most influential Aboriginal leaders have told Parliament a referendum to establish a new Indigenous advisory body would be a guaranteed failure if held too soon. The government-appointed Referendum Council last year recommended a national vote on establishing a permanent Indigenous advisory body — known as a Voice to Parliament — following a historic gathering of Indigenous delegates at Uluru. A bi-partisan parliamentary committee has been travelling the country looking for a way forward on constitutional reform after the proposal was rejected by the Turnbull and Morrison governments. 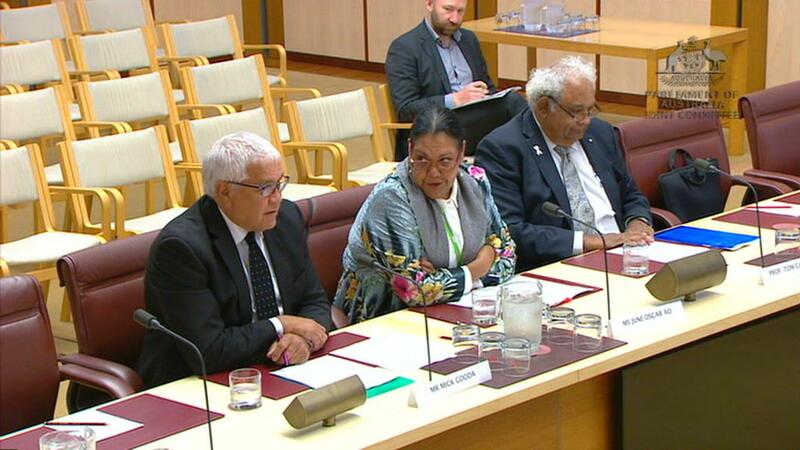 On the final day of hearings, past and present Aboriginal and Torres Strait Islander Social Justice Commissioners Dr June Oscar, Mick Gooda and Professor Tom Calma told the committee more work was needed to convince Australians. “At the moment there’s no model, and we’ve got a whole lot of people proposing you go to a referendum, and from our understanding, and we’ve discussed this, we don’t support that proposition to go now, with an open-ended referendum question,” Mr Calma said. “The key issue that we keep on getting confronted with is ‘what is the Voice’ … nobody knows what the Voice might look like and how it might operate. “There are so many unknowns, and we’re asking a very important question and response so we have an obligation to inform people with absolute clarity around the role and function of a voice, so people are absolutely aware of what … they’re being asked,” said Dr Oscar. Committee co-chair, Liberal MP Julian Leeser, questioned why the trio seemed cold on the idea, saying he had heard emphatically from Indigenous people that there was support for a Voice to Parliament. Mr Gooda said it was an important recommendation, but thought there was “not enough clarity around what the Voice is”. “If Australians don’t understand what they’re voting for in a referendum, they will vote no,” he said. Mr Gooda said a referendum on the “race power” — Section 51(XXVI) of the constitution — should be a priority “as soon as possible”, before asking the Australian public to support Voice to Parliament. The comments have disappointed some Indigenous Australians who endorsed the Uluru Statement from the Heart last May, and who see a referendum as crucial to improving the lives of Indigenous Australians. “I expect people that are supposed to be progressive to lead on this. I think they’re wrong when they say that the Australian people are not ready for this. 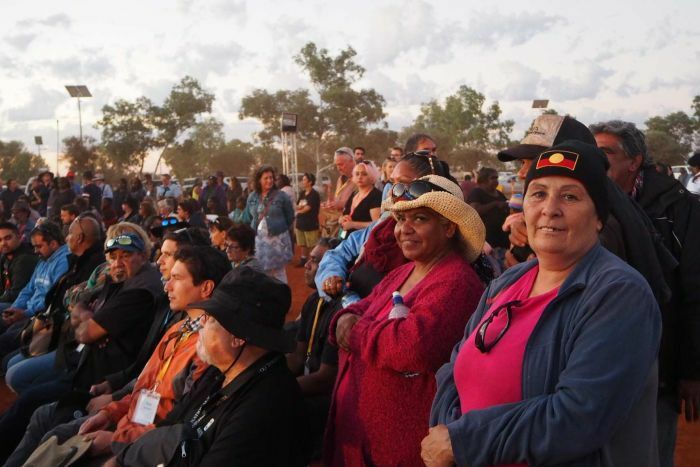 That’s why leadership is required,” said Uluru Convention delegate Thomas Mayor. Mr Mayor has travelled around Australia championing the call for a vote on an Indigenous Voice to Parliament. “We have a very clear objective coming in the Uluru statement, that has rejected constitutional symbolism, but it strongly said that First Nations people should have a Voice to Parliament,” he said. At other hearings around the country, the committee heard from several Indigenous communities who urged urgent action on constitutional reform. A former member of the Referendum Council, Professor Megan Davis, said she was confident there was support from the Australian public. “I think if it had bi-partisan support, yes, it would succeed … I’m really confident that we are on the path to a referendum,” she said. Professor Davis was honoured last night for her work on the Uluru Statement from the Heart, taking out the Australian Financial Review 100 Women of Influence award. “The joint-select committee has listened to the views, the majority views of Aboriginal and Torres Strait Islander people, this is the only way forward. A Voice, and it must have the security of the Australian constitution,” she said. Dr Calma suggested there should be a five-year campaign towards a referendum to give enough time to design the body. He said the Federal Government should fund a new campaign similar to Recognise — the multi-million-dollar awareness campaign which was defunded last year. “There needs to be a resurrection of a group like the Recognise campaign to work within the general community to canvass and re-iterate that support,” Dr Calma said. “We had momentum … that ended pretty abruptly with the Uluru Statement. “We had close to 300,000 supporters … the majority of those are non-Indigenous Australians. Mr Mayor said any future awareness campaign must have the support of Aboriginal and Torres Strait Islander communities. “There were mistakes with Recognise and the simple fact is that there was not a national consensus on what Recognise was telling the Australian people to support at that point,” he said. The parliamentary inquiry is due to deliver a final report on constitutional recognition for First Australians next month. Labor has pledged to legislate a Voice to Parliament if they win office.